Saint Bridget, known in the entire Church of God, on account of the many divine revelations with which she was graced, was born in Sweden, of noble and pious parents. 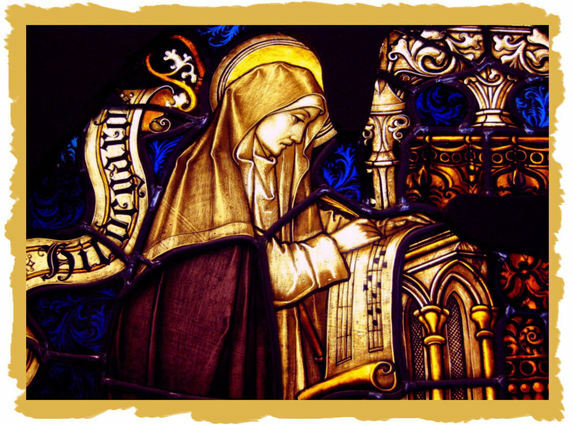 Saint Bridget had the gift of prophecy and worked many marvellous cures. Once widowed, she lived an ascetic life, eating very little, sleeping short hours, and praying continually. She followed a strict rule and practised every possible kind of charitable work. She received constant inspirations which were either taken down by her chaplain and put into Latin, thus becoming known as her Revelations, or took the form of letters to the succeeding popes, cardinals, and secular rulers of the day, telling them of their wickedness and how to reform their lives. Both in Sweden and in Rome she was either hated violently or loved as a saint. "Strong and full of courage", she lived a holy life . She founded the Order of the Saviour or the Bridgettines at Vadstena in Sweden. "A knight who keeps the laws of his order is exceedingly dear to me. For if it is hard for a monk to wear his heavy habit, it is harder still for a knight to wear his heavy armour".These were the very words of our Lord to Saint Bridget. O God, who guided Saint Bridget of Sweden along different paths of life and wondrously taught her the wisdom of the Cross as she contemplated the Passion of your Son, grant us, we pray, that, walking worthily in our vocation, we may seek Thee in all things.